Slay.one – Review, Strategy, Tips & Tricks! 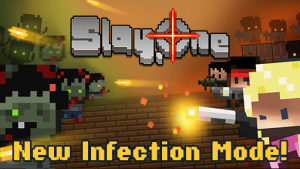 Slay.one is a free multiplayer top-down shooter you can play on your PC. Don’t let the pixel graphics fool you- the frantic action and robust game content will keep you playing for hours on end. Double the fun with friends or go online multiplayer and blast away other players with an array of devastating weapons! The game has a tutorial right after you type in your nickname and press Play. You can Log In or Sign Up to experience everything the game has to offer. The game mechanics are of typical FPS fashion- move with the WASD keys, shoot with the left mouse click and use the Q to deploy towers. The right mouse click is for jumping over obstacles, and you’ll notice that there’s a recharge bar that indicates if you can shoot your weapon again. Slay.one’s appeal lies in the various game modes that it offers. You can choose to play Free For All, Deathmatch, Team Deathmatch, Team CTF, Infection and more. Getting into a game is easy; just pick a game mode and you’ll be automatically inserted into a room with other players. Ranked play is unlocked when you reach Level 9. Matches depend on skill level and mode and can run anywhere between 5 to 15 minutes. The beauty of Slay.one is that the game developers constantly add new weapons and weapon mechanics to keep things balanced and interesting. You’ll be missing out on what makes Slay.one a fun multiplayer shooter if you don’t fully explore what the game has to offer. Get a feel for the weapons early on and see how they work best. For example, the Grenade Launcher can block escape routes and make for a highlight-worthy kill. The Shotgun is made for close quarters, while Sniper Rifles are for accurate, long distance combat. After a while you’ll have a favorite weapon and one that you rack up scores with, especially when you compete on Ranked Matches. No matter the game mode you’re playing, whether it’s Infection, Team or FFA, you’ll need to be aware of the terrain and use them to score kills. Constant practice will open up nuances and tactics that are often used in FPS games. Things such as strafing, constantly moving and not being backed into a corner will become second nature the longer you play. Slay.one even throws in the occasional box or spike trap that you must navigate around and lead your opponents in. The gear icon on the top left part of the Slay.one’s screen opens up the Options menu. Here, you’ll be able to scale the Minimap size, enable Low Graphic Effects, Weapon Bar Unclickable and All Player Names Show As Yellow. You can also change the Server or the Controls to customize your multiplayer experience. If you’re facing too tough a competition, you can change to Latin America, China, US, EU or Asia. For those ultra-cool and once-in-a-lifetime kills, immediately save the recording and have it in GIF format. Then, share with your friends or on social media!